There is nothing new about worry lines, frown lines, crow's feet or other wrinkles caused by smiling, laughing or frowning and there is a very effective non-surgical way to treat them. Botulinum Toxin is the generic name used for this product which is used for a variety of medical conditions (Brand Names are BOTOX® and DYSPORT®). It was discovered by accident almost 20 years ago when doctors were using it to treat people with facial tics around the eyes and they noticed that it also made their wrinkles improve. The treatment has now been approved for cosmetic use under the name Vistabel. BOTOX is performed using a micro-needle whereby minute amounts of Botulinum Toxin are injected into specific facial muscles. It relaxes those muscles and stops the formation of lines and wrinkles, resulting in a more youthful appearance. Q. How Does Botox Work ? Ideal BOTOX® candidates skin treatment are those who wish to see an improvement in their facial lines and wrinkles, but either do not wish to commit to a facial surgery, or simply cannot tolerate surgery. There are some minimal side effects that have been noted with BOTOX treatment, but these usually go away very quickly. Pregnant women are advised to avoid treatment, as the effect on the fetus is not yet known, and patients with certain neurological disorders are not considered good candidates. Q. How Is the Procedure Performed ? The selection of injection points is critical to the success of the procedure. The points of injection are first scored with a marking pencil. The doctor may select numerous injection points for each location to be treated. These points may not be located on the wrinkle itself, but at the area where the muscle contracts. Antiseptic is also applied. The doctor will then determine the amount of Botox to be used for the procedure. 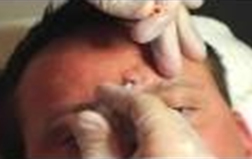 The Botox filler is then injected into the marked points beneath the skin. 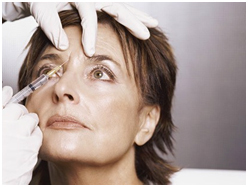 The toxins in Botox fasten to the muscles' nerve endings, which inhibits the release of the chemical acetylcholine. This will stop the muscle contractions that wrinkle the skin. Q. How Long Does a Botox Injection Last ? Recovery following BOTOX® treatment is usually very brief, and you will be able to resume most normal activities immediately. It is recommended that you do not lie down for several hours after the procedure, and that you refrain from massaging the treated area or participating in particularly strenuous activities for 24 hours. The BOTOX® results usually last between three to six months, though results will vary based on the patient and the area injected. The main potential benefit of BOTOX® injectable skin treatments is the chance to take years off of your facial appearance by eliminating frown lines, crow's feet, and other minor facial wrinkles. There have been very few potential risks of BOTOX® that have come to light thus far, though pregnant women, patients suffering from neurological disorders, and people taking certain medications and antibiotics are not considered good candidates for the procedure. Q. Are there any side effects ? Some patients experience a slight temporary bruising at the injection site. This may be covered up with make up. In some cases, the toxin can migrate and cause temporary weakness to nearby small muscles. In rare cases there can be drooping of an eyelid or asymmetry of facial expression. The risk of any side effect depends upon the muscles injected. Your doctor will discuss this with you in detail before the treatment. Because the effects of Botulinum Toxin are completely reversible, any side effects are temporary, lasting only a few weeks. Q. Who Should Not Receive Botox Injection ? Q. What are the limitations of Botulinum Toxin ? Q. Will my facial expressions look natural after treatment ? Although the effects and results are visible after about three days, treatment with Botox will not dramatically change your facial appearance or make you look totally expressionless The muscle activity that causes the forehead frown lines is simply reduced, so you should still be able to frown or look surprised, just without wrinkles and creases between your brows.